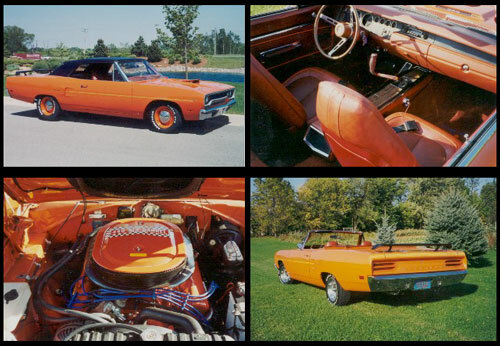 Here is my 70 Plymouth Road Runner Convertible. Rare factory High impact Vitamin C paint, Woodgrain-wheel, Rare Burnt Orange buckets with console, and pistol-grip, 6-way seat, power windows, hood-pins, Hemi suspension, airgrabber-hood. Also has an unusual factory coded rear GOLD transverse stripe. Factory 383 long gone. Now has 460 HP 490 Tq. 440/6, MSD ignition, 391 gears, superstock springs, TTI headers, Dynomax mufflers and 2 1/2" exhaust with stainless tips. Lots of power and fun to drive.